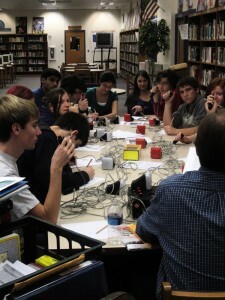 From bones to geography, optics to archeology, the quiz bowl team at Penn Manor knows it all. That is exactly what Penn Manor’s first-place quiz bowl team is doing. This Penn Manor team is first in the league, out of a total of 24 teams. With a record of six wins and zero losses, and a total cumulative score of 1110. They average about 185 points per match. The team gets their practice questions out of quiz books in the library. They practice every Monday 3-4:30 unless they have a competition. Though their practices are laid back and fun, they can get competitive when need be. “Other teams get really frustrated, and you can see that. We’re not like that. That’s our strength,” said junior Lars Andersen. At their latest practice on Monday, they had a lot of inside jokes and everyone got along and laughed together. Hmm, what is the term for the study of light, the team fell silent. A synchronized “DUH!” filled the library. The most entertaining event at practice was when a senior reprimanded his buzzer because it would not work. The rest of the team includes Brendan Stoekyl, Henry Stewart, Morgan Flood, Corey Delmonto, Georgina Waldman and Helen Hutchins, though the practices include others. They continue to work toward a state competition this year.